Emma Peel The Avengers Cosplay Tutorial feat. Eyelash DISASTER!! Emma Peel. Obviously I don’t own this picture. Emma Peel in the costume that got her banned from American TV. I didn’t have the right corset/bodysuit to do this costume/makeup look but perhaps in the future. Obviously I don’t own this picture. Emma Peel The Avengers Cosplay. I didn’t have a gun because you’re not allowed them in the UK. And I will continue my Interrail adventures tomorrow. So I had a long black wig and Morticia was too easy for the first use of the black wig (plus I need something resembling an evening dress before I can do Morticia), so I decided to do a hair, make-up and costume tutorial for a Wednesday Addams cosplay which I uploaded to Youtube. And here’s the link to the Youtube video with the full Wednesday Addams tutorial. Enjoy. Click here to find out how to get picture perfect skin for cosplaying. And how to work out the right proportions for your own eyebrows! What do you think? I’ve thickened my brows up a bit since I recorded this (last week, can you tell because my lips are a bit bigger than they were the week before, but not as big as they are in this pic from this morning)! Me this morning. Just need to work out a way to get my neck to take fake tan so it’s darker than my face for a change! My chin is looking so much better now (compare it to in the video); I’d forgotten lip plumping fixed that for me!! I used the Collection 24 hour eyeliner in Brown to do my brows. Use what you’re comfortable with (unless you don’t have anything, in which case I recommend this eyeliner because it doesn’t run or smudge which is SO important for brows unless you live in a safe bubble of no rain, steam or showers)!! Princess Leia Tutorial: Hair, Make-Up and costume from Episode IV: A New Hope. Princess Leia Tutorial: Hair, Make-Up and costume from Star Wars Episode IV: A New Hope. Princess Leia tutorial from Star Wars Episode IV A New Hope end result. I promise I’m wearing the floor length skirt in this picture!! Princess Leia from Star Wars Episode IV A New Hope. I was very tired after such a long tutorial so thought I’d rest my head! A close up of Princess Leia’s face and hair (mmm… cinnabons) from the Star Wars Episode IV A New Hope tutorial video. So this is what I spent all day doing yesterday. 2x hair extension ponytails from China £1.56 each (ish). 1x white polo neck top in size UK16 (USA 12), £3.50 (ish). 1x long white skirt in size “one size fits all” (tschah), £4.50 (ish). If I did it again I’d buy a better skirt because this one had gaps that were too wide and there is no WAY that it would fit anyone bigger than a 10 (US6). Additionally, they listed it as white and it’s *blatantly* cream so it clashes a bit with the top. These things don’t show up in the photos (because the skirt doesn’t really show up in the photos. I am wearing it in every picture and throughout the video, and it’s floor length). I am actually thinking of buying a better skirt, but I already bought that one, and it’s not worth paying the return postage because it’s going to be nearly as much as the skirt was. I would also get a top in a size 18 instead of a 16 because the advice on buying baggy clothing was lacking and I was worried I’d be lost in the longer sleeves which was redundant thinking. I’ve made some comedy videos of Princess Leia (because a 7 hour tutorial ought to be used for something longer than just the tutorial) doing random stuff, they will be on Youtube pretty soon. I’ll link them when they’re up. The first time I had dal (or dhal, never sure how to spell it) I hated it! I was at a fancy restaurant where they served up mushy, flavourless stuff that was like yellow mash potato! The second time I had it, I was at a Nepalese restaurant (the Yak and Yeti Gurkha Restaurant, York, loads of vegan options and very good value for money) and it was wonderful. 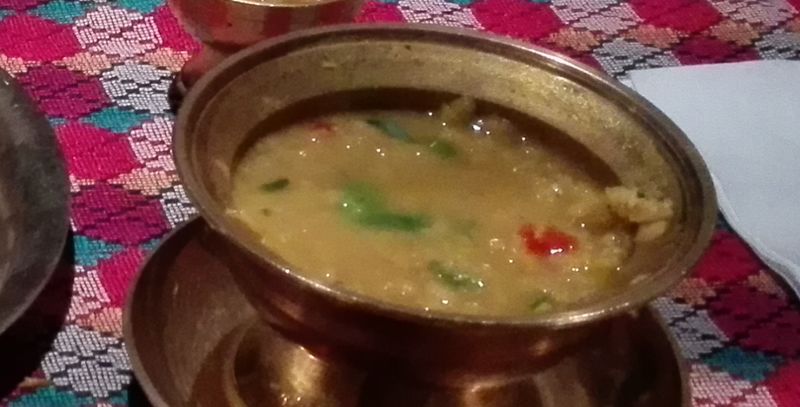 Tasty dhal at the Yak and Yeti Gurkha restaurant, York. 1. Yellow mung dhal (moong daal) lentils. I buy the ones that don’t need to be soaked. 3. Bhuna or balti paste (a tablespoon is ample), or if you can’t find the paste, use a quarter of a jar of the sauce instead. Patak’s do a nice one. Get a fine meshed sieve and wash your mung dhal lentils until they are clumping together – this removes some of the starch. Pop them into a saucepan and cover with boiling water. Add a teaspoon of coriander (cilantro). Simmer for about 30-50 minutes, depending on how mushy you want it. When it has softened enough, drain and add the bhuna paste or sauce (or balti), and stir it into the dhal, stirring in the rest of the coriander (cilantro). Leave on a very low heat for at least 10 minutes so the flavour penetrates the lentils. Stir regularly so it doesn’t burn the bottom of the pan. Serve in a bowl, either on its own or with rice. Nutrition: Gluten free, dairy free, 80g of moong dal lentils are one of your five a day (and a separate one to regular lentils because they come from different species of plant), 30g of protein per 100g of uncooked moong dal lentils and 45g of carbohydrate per 100g of uncooked moong dal lentils.